Spent some time today to setup VMware VSAN in my Home Lab so thought of dedicating an article to understand the configuration of VSAN in your environment. Those of you who already have their Home Lab setup and are planning to test the functionalities of VMware VSAN this article will help you and those who didn't have the Home lab setup need not to worry as we will be learning something New through this article. Let's start with the prerequisites that we need to take care of before we set up the VMware VSAN cluster in our environment. A minimum of three ESXi 6.0 hosts contributing local storage. For all flash configurations, each host must have a minimum of a single physical 10 GB Ethernet NIC available for Virtual SAN use. 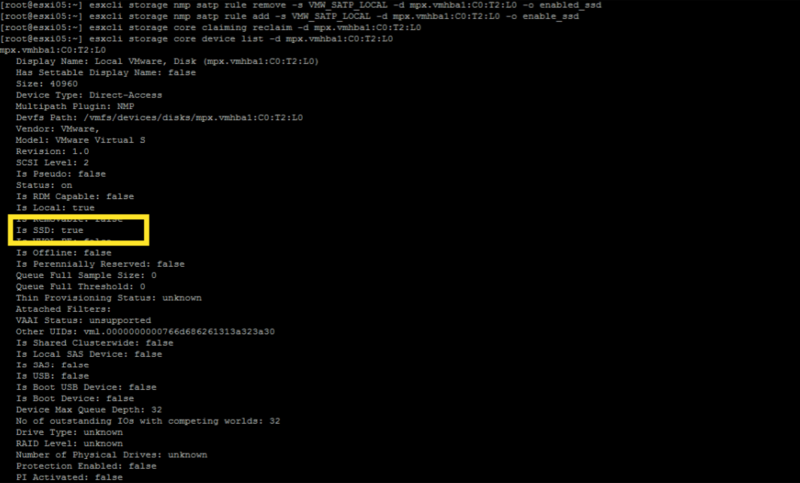 VMKernel Port on each host dedicated for VSAN traffic. In my home lab when i planned to configure VMWare VSAN I only had two ESXi host so quickly created the third ESXi host and added it to the cluster and enabled VSAN. But it was not that straight forward as all of my ESXI's only had one disk which was initially being used when the ESXi host was installed so added more Disks to my ESXi so as these disks can be leveraged in VSAN Cluster. VMware VSAN is all about leveraging underlying SSD's and HDD's presented on ESXi's host and creating VSAN shared datastore that's what we will also try to achieve from this post. Still I was not able to proceed further and create Disk Groups ? What is a Disk Group ! To understand what is a disk group let's go back to Old Days when we took our first Virtualization lesson and learnt the definition of Virtualization "Abstracting the Underlying Hardware Resource and Pooling them together". That's what we are doing abstracting the underlying HDD's and SSD's from each ESXi host and creating a main unit of storage known as DISK Groups. For creation of Disk Groups each ESXi host must have a minimum of One SSD and One HDD in case of Hybrid Architecture (SSD+HDD) whereas in a DISK Group we can also have all the SSD's in ALL FLASH Architecture. Minimum of one SSD is required but that wasn't the case in my Home Lab because all the extra Disks i added were added as HDD's, which was preventing the creation of Disk Groups. It was time to play with ESXCLI commands and mark at least one disk as SSD to ensure the successful creation of a Disk Group. 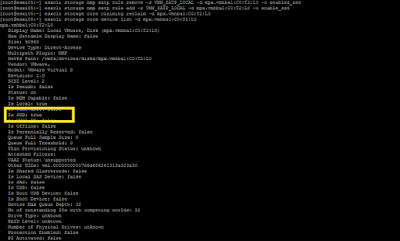 Connected to all my hosts through putty and executed below ESXCLI commands. 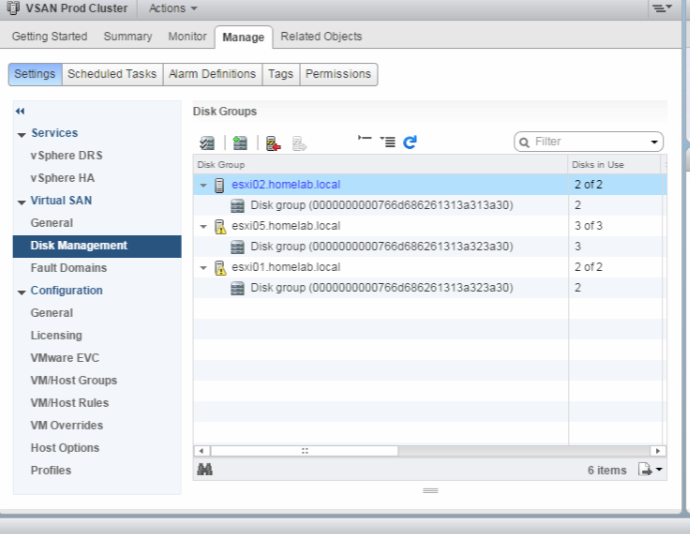 Now that we have marked one of the Disks from ESXi host as SSD it time to check if the Disk groups are now created. I was able to see the disk groups and the VMware VSAN shared datastore created and the disks (SSD+HDD) been leveraged from all my ESXi host, the warning message on ESXi host is because of SSH service still running. Was not able to wait and see my Virtual Machine spinning on newly created VMware VSAN shared datastore so storage vMotioned Virtual Machine (vMA) on VSAN Datastore. To Summarize VMware VSAN is a cluster level feature which needs a minimum of 3 ESXi hosts talking to each other on same VSAN network and each host must have a minimum of one SSD and one HDD for creation of Disk Groups. Will be dedicating more articles talking about the policies and features of VMware VSAN.